Jeffer Mangels Butler & Mitchell LLP (JMBM) is pleased to have represented client Right Away Redy Mix in its sale to U.S. Concrete Company. JMBM partner L. Randolph Harris led the deal team, a resident in the firm’s San Francisco office. Financial Advisor to Right Away Redy Mix was the Greystone Group (San Diego); U.S. Concrete was represented by Akin Gump Srauss Hauer & Feld LLP (Los Angeles). About Right Away Redy Mix Inc. Right Away Redy Mix consists of two related corporations: Right Away Redy Mix Inc and Rock Transport Inc., which work together to provide a wide range of ready-mix and delivery services. Right Away Redy Mix delivers concrete to the Bay Area from four convenient locations, specializing in servicing small contractors and homeowners in Alameda and Contra Costa Counties. Rock Transport delivers dry bulk products and aggregates throughout the Bay Area. 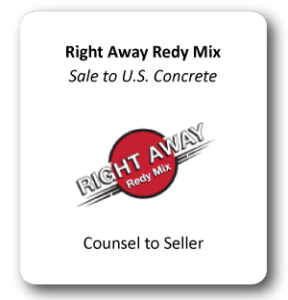 For more information visit www.rightawayredymix.com. JMBM’s Corporate Law Group represents private and public companies, as well as investment funds and other capital sources, in a wide variety of transactional matters including mergers, acquisitions, divestitures and financings. Our lawyers provide start-to-finish assistance with the structuring, negotiation, documentation and closing of the deal, using the firm’s full resources for everything from intellectual property issues to tax-efficient deal structures. With offices in San Francisco, Los Angeles and Orange County, JMBM serves its clients worldwide. For more information visit www.JMBM.com.